The accumulation is little in Central Missouri, but slick conditions had many struggling to get to school and work. The Missouri Department of Transportation says as snow continues to fall across the state, it’s reminding motorists to use caution. Click the map to be redirected to the MoDOT Traveler Information Map interactive. “This is the first winter weather event of the season for many Central Missouri drivers, and there are ways to be prepared for driving on wet or snowy roadways,” the Department says, and offers these pointers for getting there safely. Before the trip, make sure your car is winterized with fresh antifreeze, correct tire pressure, a good battery, and oil that will withstand the rigors of cold weather. Equip your car with a first aid kit, a flashlight, extra blankets, sand to use for traction under your wheels, and other items to help in an emergency. If possible, consider postponing your trip until precipitation has ended and roads are clear. If you do have to travel, adjust your speed to suit driving conditions, always wear your seat belt, and double the space you leave between you and the next vehicle. Give snow plows plenty of room. Remember that a salt spreader attached to the back of the truck is most likely distributing material as the truck moves along a route. 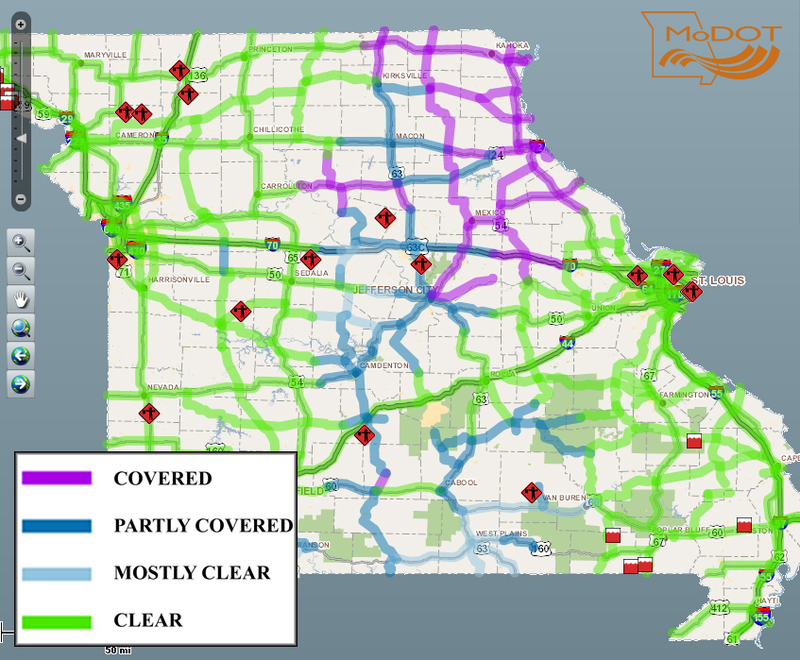 MoDOT’s Traverler Information Map is updated in real time around the clock at www.modot.org, giving an updated view of weather-related road conditions for major Missouri highways, whether a highway is closed, covered, partly covered, mostly clear or clear. Motorists can also call MoDOT’s customer service center for road conditions at 1-888-ASK-MoDOT (888-275-6636), where a live person answers the phone 24-hours a day, seven days a week, 365 days a year.